So unless there is a FEAR of an undesirable consequence then arguably its not on the OCD continuum at all. It’s this fear thats at the crux of OCD , it’s often translatable to the fear of REALLY bad stuff happening, often involving fears of illness or death. Behaviours and rituals (thats the compulsion part) then develop to stop this bad stuff from happening and it’s just too scary to contemplate not doing the behaviours, there’s an absolute compulsion to do them to counteract the fear. Generally the fear IS counteracted and the person is comfortable again but sadly this is all too often for only a short amount of time. Most people who struggle with OCD are very aware that their fears are irrational but this awareness rarely helps on its own. It’s really important to wage battle on OCD, it’s a battle that can be won and now there are many interventions that can really help. CBT (Cognitive Behavioual Therapy) offers a particularly helpful proactive approach to moving beyond OCD and when integrated into a process orientated therapy experience can, in my opinion, be the missing piece of the jigsaw! 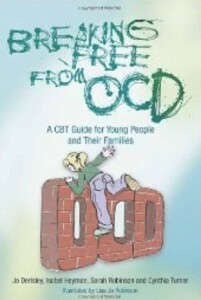 This is a useful book written for young people who struggle with OCD, check it out and recommend to appropriate clients.